In addition to the workshops that I conduct throughout the year as part of the Edutorium programme at Nanyang Technology University in Singapore I give presentations and conduct professional development workshops for academics, teachers and trainers located in Australia and overseas in the areas of 21st century instructional technologies, eLearning course design, curriculum integration and related pedagogies. I have listed the key presentations and workshops that I have conducted during the previous 20 years below. Please review my details on LinkedIn or contact me directly via email. Good To Great Teaching and Learning Conference, Singapore. Assessment in eLearning. Nanyang Academy of Fine Arts, Singapore. 1st October, 2014. Digital Storytelling, Creative Imagery and Education Technologies in the School Curriculum. Upper Hunter Valley DET Staff Development Day. 15th July, 2013. Digital Storytelling, Practical Social Media and iPad in Education presentations. Waverly College, Sydney. 28th April, 2014. Digital Storytelling in Education. National University of Singapore. 24th April, 2013. Social Media in Education. National University of Singapore. 24th April, 2013.
iPad in Education and Training. Presentation and workshop given to trainers and educators at the Institute of Adult Learning, Singapore. 17th April 2013.
iPad in Education Workshops. Release the Geek Training Seminars, Melbourne, Victoria and Albury, NSW. 19th to 21st March, 2013. Digital Storytelling and Creativity Anywhere, Anywhere with the iPad. MANTLE Conference, Newcastle, NSW, Australia. 22nd June 2012.
iPad in Education and Training. Presentation and workshop given to trainers and educators at the Institute of Adult Learning, Singapore. 18th April 2012.
iPad application in the tertiary curriculum. Lee Kong Chian School of Medicine, Nanyang Technology University, Singapore. 16th April 2012.
iPad in the Secondary School Curriculum. Presentation and workshop given to teachers and technical assistants at Nanyang Girls High School, Singapore. 12h and 13th January, 2012. Let’s Get Social ~ Social Media in Education. 60 minute presentation given to educators from across the Illawarra and Southern Sydney area at the 2011 ASTD Conference, Port Kembla Golf Club Conference Centre, Illawarra, NSW. 13th September, 2011. Cloud Toolkit for Educators. 60 minute presentation given to educators from across the Illawarra and Southern Sydney area at the 2011 ASTD Conference, Port Kembla Golf Club Conference Centre, Illawarra, NSW. 13th September, 2011. Social Media in Education. Two 60 minute presentation given to TAFE teachers at The Gordon TAFE, Geelong, Victoria. 27th May, 2011. Engaging Generation Y with 21st Century Technologies. 3 hour presentation to staff from Singapore Institute of Management University, Singapore Armed Forces Training Institute, Singapore Ministry of Home Affairs and the Singapore Civil Service College. Singapore Civil Service College, Singapore. 4th October, 2010. The Apple iPad: Creativity, Collaboration and Convergence Beyond The Classroom. Centre for Excellence in Learning and Teaching, Nanyang Technological University, Singapore. 27th September, 2010. Journeys With Technology . East Hills Girls Technology High School, Panania, Sydney. July, 2010. Mobile Technologies in Education. Centre for Excellence in Learning and Teaching, Nanyang Technological University, Singapore. 5th July, 2010. Learning with 21st Century Tools. Santa Santa Sabina College, Strathfield, Sydney. 11th June, 2010. The Pros and Cons of Cloud Computing in Education. Centre for Excellence in Learning and Teaching, Nanyang Technological University, Singapore. 12th April, 2010. Expanding the way learners think. Practical “Web 2.0” skills for teachers and their students. 2010 SWSR ICT Conference. Inspire Innovate: Leading Digital Learning. NSW Department of Education and Training. 23rd and 24th March, 2010. Acer Arena, Sydney. The real joy of sharing and learning. Digital storytelling & web 2.0 skills for special needs teachers and their students. 2010 SWSR ICT Conference. Inspire Innovate: Leading Digital Learning. NSW Department of Education and Training. 23rd and 24th March, 2010. Acer Arena, Sydney. Web 2.0 Technologies in the Organisation. Presentation. Centre for Excellence in Learning and Teaching, Nanyang Technological University, Singapore. 19th January, 2010.
eLearning Implementation and Web 2.0 Technologies in the Higher Education Sector. Presentation and 4 day workshop. 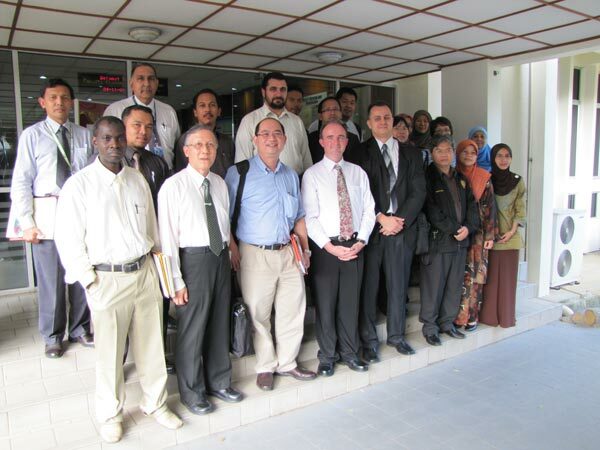 AKEPT Higher Education Leadership Academy Malaysia, Ministry of Higher Education, Malaysia. 19th to 24th November, 2009. Education and The Social Web: Taking Learning Beyond The Classroom. Presentation with Dr Kevin Lim of the University of Buffalo. Nanyang Technological University, Singapore. 14th October, 2009. Working with Cloud Computing in Education. eLearning Festival. Nanyang Technological University, Singapore. 7th October, 2009. Education and mobility in the 21st Century. Edutorium presentation. Nanyang Technological University, Singapore. 13th July, 2009. Getting Wired and Being Connected. Innovative technologies for principals and leaders in education. ACEL NSW State Conference, MLC, Sydney. 21st June 2009. Virtual Professional Development and Personal Learning Networks and Digital Storytelling. Presentations conducted at the annual Nanyang Teaching and Learning Seminar: Blending Right, Blending Wrong: Know The Difference? 28th – 29th May, 2009. Getting Started with Web 2.0. Macquarie ICT Innovations Centre ~ Thinking Globally, Delivering Locally VC Seminars. March 27th, 2009. Via video conference. Getting Started with information technology and curriculum integration ~ putting knowledge into practice. Weaving Technology ~ CAP NSW. Ungarie, NSW. 19th December, 2008. Via video conference. Integrating Web 2.0. Technologies into the clasroom. Weaving Technology ~ CAP NSW. Riverina, Wagga Wagga, NSW. 23rd October, 2008. Introduction to Web 2.0 Technologies. Weaving Technology ~ CAP NSW. Riverina, Wagga Wagga, NSW. 23rd October, 2008. Web 2.0 technologies and their integration within the edveNTUre Blackboard Learning Management System. Presentation. Nanyang Technological University, Singapore. 8th October, 2008. Web 2.0, the read-write web and their application in the classroom. Presentation. Nanyang Technological University, Singapore. 14th July, 2008 and 6th October, 2008. What’s New? Explore and exploit Web 2.0 in the corporate sector. Presentation to Singapore Airlines staff, Singapore Airlines Training Centre, Singapore. 17th April, 2008. Extending the boundaries of Web 2.0 and the read-write web. Presentation. Nanyang Technological University, Singapore. 14th April, 2008. What’s New? Explore and exploit Web 2.0 and beyond. Plenary presentation. Good To Great 2008 Teaching and Learning Conference. Nanyang Technological University, Singapore. 27th February 2008. Web 2.0 in the Classroom. Three day workshop. Innovative Technology Schools Conference, University of Technology, Sydney. 11th to 13th December, 2007. What In The World Is Web 2.0 And How Can It Empower You? 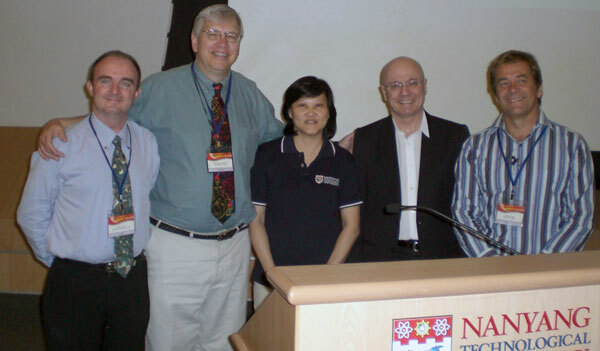 Presentation at Nanyang Technological University, Singapore. 9th July, 2007. The Phenomenon That Is Podcasting. Young IT Seminar. Australian Computer Society ~ NSW Branch, Sydney. 5th July 2007. Fusion Recipes for Blended Learning. “Teaching: From Good to Great Act II” Conference. Nanyang Technological University, Singapore. 26th February, 2007. Technology Applications to Enhance Content Development. “Teaching: From Good to Great Act I” Conference. Nanyang Technological University, Singapore. 23rd February, 2006. Developing Media Rich Learning Environments. “Teaching: From Good to Great” Conference. Nanyang Technological University, Singapore. 22nd February, 2005. Digital Video as an Instructional Medium: Storyboarding, developing and evaluating digital video projects. Two-day presentation and practical workshop. Humanities and Social Science Education Academic Group and the Centre for Instructional Technology, National Institute of Education, Singapore. 10th and 13th July, 2004. Planning and Designing Online Courses. Workshop at the Blackboard Certified Education Centre. CED. Nanyang Technological University, Singapore. 16th April, and 6th July, 2004.
eLearning: Towards a University of Global Excellence. Presentation and interactive seminar at 1st Sino-Singapore Undergaduate Exchange Programme, Nanyang Technological University, Singapore. 5th December, 2003.
eThinking: eCoaching and eModerating ~ Bridging the gap between traditional and online pedagogies. Presentation at Teachers’ Network Graduation Ceremony, Training Branch, Ministry of Education, Grange Road, Singapore. 11th September, 2003. Lecturing to Large Lecture Classes. Presentation at Staff Orientation Seminar. Nanyang Technological University, Singapore. 5th September, 2003. Professional Development and eLearning: Bridging the gap between traditional and online pedagogies. Opening address at Nanyang Technological University and Blackboard International collaboration and establishment of Certified Education Centre, Singapore. 25th August, 2003. Advanced Digital Video Workshop. Itopia Conference, Suntec City, Singapore. 25th July, 2002. Cross Platform Educational Technology. Simplifying Technology, Enriching Learning Conference. Kuala Lumpur, Malaysia. 15th August, 2000. Innovative Interactive Multimedia and Educational Technology. Temasek Polytechnic, Singapore. 17th February, 2000. Information Technology and Curriculum Integration Workshop. Innovative Technology Schools’ Conference. University of Wollongong, NSW, Australia. 4th to 9th December, 1999. Interactive Multimedia and Educational Technology: Exploring The Nardoo. TILT Conference. Sydney, NSW, Australia. 11th March, 1999. What Have I Learned? Presentation together with Russell Gluck, Wilma Vialle and Pauline Lysaght. ACILITE Conference. University of Wollongong, NSW, Australia. 15th December, 1998. Information Technology and Curriculum Integration Workshop. Innovative Technology Schools’ Conference. University of Wollongong, NSW, Australia. 7th to 12th December, 1998. Information Technology and Curriculum Integration. Presentation. Deputy Principals’ Conference. Novotel Conference Centre, Wollongong, NSW, Australia. 27th August, 1998. Interactive Multimedia and Educational Technology: Exploring The Nardoo. TILT Conference, Sydney, NSW, Australia. 20th August,1998. Information Technology and Curriculum Integration Workshop. Innovative Technology Schools’ Conference, University of Wollongong, NSW, Australia. 8th to 12th December, 1997. Interactive Multimedia/Web Curriculum Integration Workshops. Apple Singapore. Singapore. 14th to 18th July, 1997. Information Technology and Curriculum Integration Workshop. Innovative Technology Schools’ Conference, University of Wollongong, NSW, Australia. 25th to 29th November, 1996. Problem Based Learning and Information Technology. Co-presenter. Australian Teaching Council, Winter School, University of Sydney, NSW, Australia. 5th July, 1994.